Berlin's title as the UNESCO’s "City of Design" extends well beyond its world-class museums and onto the street. For a city that has often faced division and oppression, street art was a way for everyday people to speak out. In fact, Berlin just opened its first street art museum to educate locals and visitors about this particular kind of art. Street art has become a credible form of expression, and Berlin has a thriving scene of international contributors. Many of the world's top artists have contributed to the landscape, changing the ever-evolving face of Berlin. And as fast as new pieces go up, old pieces are covered up, weathered beyond recognition, vandalized, or even removed by the artist (like BLU and JR's legendary gold-bedecked figures showing "east side" and "west side" at Curvybrache). Whether they have put up small stickers, medium stencils, or massive murals, a tour of Berlin's best street art reveals a the story of the city. While every inch of Berlin seems to be marked with some kind of graffiti, certain areas are richer in quality street art. Check out Berlin's 10 best street art pieces mentioned, and then continue exploring with a visit to these locations for more. There are also many tour options for alternative Berlin and tours focused exclusively on Berlin's street art to expand your understanding. The Cosmonaut is a distinctive piece in Kreuzberg by Victor Ash. It has graced this wall since 2007 and is one of the most popular pieces in Berlin. Fawning photographers can be seen here taking a snap day or night. The mural has been called the world's largest stencil, but it was actually painted with black paint (look for the drips) using a grid and painstakingly put together square by square. When it was first painted, a nearby flagpole cast a shadow that drifted across the scene eventually ending in the Cosmonaut’s hand. He claims this land, much like the astronauts involved in the space race between the USSR and America that inspired the French artist. Where: Mariannenstrasse. The closest UBahn is Kottbusser Tor on the U1. 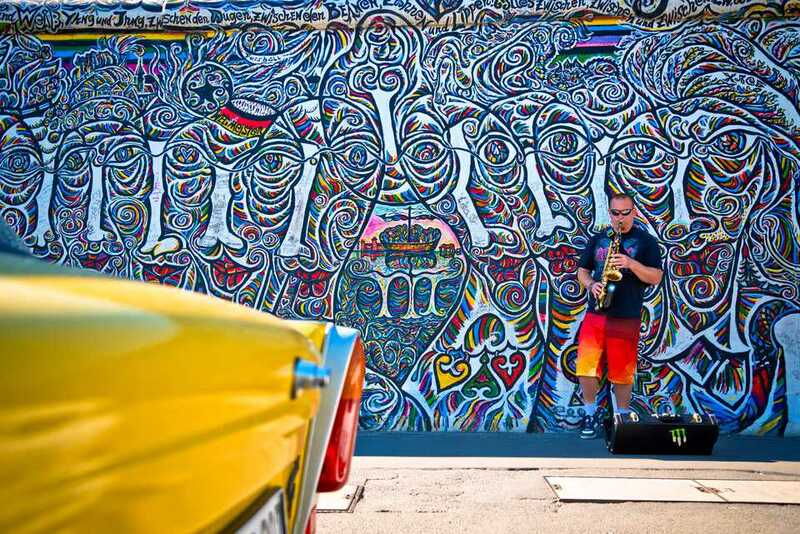 The longest remaining stretch of the Berlin Wall is a top Berlin attraction and one of the first major public canvases for urban artists. Once a divider, it is now a major draw and a platform for street art from 118 well-recognized International artists. The original pieces were put up shortly after the fall of the wall in 1990. The work has been replenished throughout the years, but the most famous sections remain. For example, "My God, Help Me to Survive This Deadly Love," more commonly known as the "Fraternal Kiss" by Dmitri Vrubel, still gets stares. The image shows Soviet Leonid Brezhnev and East German President, Erich Honecker, locked in a passionate kiss. Another beloved piece is Thierry Noir’s cartoon faces which now also adorn tourist knick-knacks. Besides these well-recognized pieces, the backside of the Gallery (on the side of the Spree) has become open ground for new graffiti. Often just amateur tagging, it shows this is still the greatest street art galley in the world. Where: Located between the banks of the River Spree and Mühlenstrasse in Friedrichshain. The closest stations are Ostbahnhof or Warschauerstrasse. Famed Italian street artist BLU has been creating unique street art since 1999 from the West Bank to Peru. He is responsible for this eye-catching piece just off the Oberbaumbrücke. Sometimes called Leviathan or Backjump, it is one of the most beloved pieces in the city. With fabulous views on either side of the bridge, it's easy to miss it. But for those that tilt their head slightly up (or catch a glimpse as they roar by on the UBahn), it is one of the most identifiable pieces in Berlin. This full-wall mural is a surreal image of one large pink figure composed of hundreds of interlocking, writhing bodies. In its hand one white figure is being examined, or perhaps preparing to be eaten. Where: On the Kruezberg side of Oberbaumbrücke, just before you continue on Falckensteinstrasse. The closest UBahn (subway) is U1 at Schlesisches Tor or across the river in Friedrichshain at Warschauer Strasse, or the S-Bahn 5 or 7 at Warschauer Strasse. This large-scale mural is typical of Belgian artist ROA. He often features native wild animals in an urban setting, often in a state of decay. This piece was commissioned by Skalitzers Contemporary Art in 2011. Drawn with aerosol spray cans in a black, white and gray, this is a striking image of hanging game. It fits with his usual themes of the temporary nature of life, and also of street art. Where: Corner of Oranienstraße and Manteuffelstraße. The closest UBahn is Görlitzer on the U1. Well-known French street artist, JR, only spent a month in Berlin in 2013 but he left quite an impression. His "Wrinkles of the City" series is on 15 buildings in central Berlin and is part of an ongoing project that appears in cities around the world. The artist's work first appeared in Paris where he plastered paste-ups of young Parisians from the projects in the city's poshest areas for "Portraits of a Generation." His works seeks to bring people together and make the world a better place, earning him the prestigious TED Prize in 2011. "Wrinkles of the City" began in 2008 in Cartagena, Spain. In addition to Berlin, it expands into Havana, Shanghai, Los Angeles, and Istanbul. The work showcases each city's elderly citizens in contrast to our "youth-obsessed, progress-driven world". The 15 pieces in Berlin paired elderly Berliners' close-up portraits with locations significant to their personal experience and historic events such as the location of the Berlin Wall, areas affected by the iron curtain, and many of the other events that marred the city's history. JR utilized the often crumbling facades of the buildings to emphasize features like the wrinkles of his subjects. This gallery wall adorns the side of one the city's best independent movie theaters. Stickers, stencils, and one-of-a-kind pieces are routinely put-up, pulled-down, and reapplied in a never-ending cycle. The kino (cinema) is located at the busy corner of Boxhagener and Niederbarnimstrasse, quintessential Friedrichshain. There is a cafe that spills out in front of the cinema and people-watching is at its finest. Make note as the hordes of people stop to admire the latest street art. Where: Boxhagener Strasse 107. The closest UBahns are Frankfurter Tor and Samariterstraße on the U5. The simply titled "Yellow Man" is a comical piece. Created at an intersection of streets in June 2014, you can't miss this odd figure and de facto symbol for the neighborhood. The artist Os Gemeos actually consists of two street artists. They are Brazilian twins Otavio and Gustavo Pandolfo and their joint name means "the twins." The genderless figure is from a shared dream of yellow creatures. Where: Schlesisches Tor/Oppelner Strasse. The closest UBahn is Schlesisches Tor. Another work by BLU, this cynical depiction of economy and politics shows the fall of the Berlin Wall and the rise of the euro. This straight-forward piece offers harsh criticism of the changing climate in Germany and Europe. Where: Köpenickerstrasse in Kreuzberg. The closest SBahn is Ostbahnhof. Put up in 2014 while Obama was still in office (the other two remain in power), it still gets instagrammers and selfie-takers regularly. Where: Ritterstraße 12. The closest UBahn is Mortizplatz. Two of the last remaining squats in the city, Rigaer Strasse 83 and 94 provide an ever-changing platform for political commentary. Banners call out for social change, and bold splashes of paint showing smiley faces and cartoon birds mark these buildings as different from their neighbors. While there is not one piece of street art to look for, the whole buildings are representative of what this rapidly gentrifying neighborhood once was. Often the site of police crackdowns, this is also the center for community projects and activism. Fischladen is an anarchist bar at the base of Rigaerstrasse 83 and a meeting point for leftist forces. And though clashes with authority have been violent in the past, most actions are premeditated and civil nowadays. Where: Rigaer Straße 83 & 94, 10247 Berlin. The closest UBahn is on the U5 at Samariterstraße.